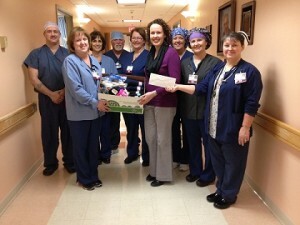 Members of Millinocket Regional Hospital’s OR Department gathered with Katie Carr, School Nurse of the Millinocket School Department, to give a donation that they gathered together as a department. Members of the OR Department chose to pool their money as opposed to doing a “Yankee Swap” or “Secret Santa” during the Holidays this year. They also collected school supplies and clothes to give to Katie to help purchase items needed for students who may not have much at home. “Sometimes kids have accidents and need extra clothes, and those extra clothes aren’t always available,” said Carr. The members who donated include, Margaret Fiske, Denise Gardner, Christine Jandreau, Kristina Winslow, Cynthia Hodge, Peter Michaud, Steve Arsenault, Lawrence Hallett, Marsha Northway, Bruce Rioux, Judy Knowlton, Karen Nicholson, Laurie Jamo, Harriett Daisey, Dr. Kowalski, and Dr. Tsintzilonis. The department plans to do this again next year, and encourages other departments or businesses to consider doing the same.